Personality:A master of observation and deduction, Silex has a complex character that dragons never seem to understand. Silex has a powerful thinking process that is exposed whenever he speaks, using rhetorical questions and wording that make him hard to understand at times. He can be exceptionally witty when he feels. He absolutely adores a good mystery, and gets excited whenever he's figured something out, or in the process of it. Silex has a slight problem with wanting to always be right, and his bohemian lifestyle makes dragons.. weirded out by him to say the least. Or perhaps the fact that but he chooses to suppress most of his own emotions as he believes they obstruct him from thinking logically unsettles others. Silex very often catches himself being bluntly and brutally honest. When he gets bored, Silex can get encouragingly more strange. Hobbies:Solving mystery’s, reading, proving himself right. Likes:Eavesdropping, Dancing, Running, Singing, making music. Dislikes:Climbing, Ice, sand, being touched. Fears:Terribly frightened of being buried alive, drowning, water. History:Silex didn’t have a great childhood. His father, who separated him from his mother and sister, was a violent dragon. He disapproved of Silex’s lack of fighting skill, as many Blood Razors possessed. Constantly, his father increasingly pushed Silex to fight, and when Silex refused, Qyldayrth would attack him. Silex dealt with his father for a few years, before deciding he’d had enough. In the middle of the night, while Qyldayrth was hunting, Silex ran away, seeking refuge in a tunnel under the Vuari mountains. He managed to get into the library, convincing the locals that he was a wanderer, simply looking to expand his knowledge of the nearby tribes. He managed to learn Vuarish, through a long period of practice. The locals didn’t seem to mind him having a extended stay. Eventually, when he’d read most of the books in the library, he began to travel again. Whenever he met dragons, he took notes on how they acted, how they spoke. Silex slowly began to discover his keen mind, he picked up details others didn’t, caught the subtle changes that other dragons never even noticed. He could even predict other dragons actions and even their personalities without even meeting them. Hearing about the Kaamil, and being fascinated by they’re intelligence and magic skill, Silex was inclined to travel there. He had almost made it when he met another Blood Razer, his mother, Aydryr. It wasn’t a happy reunion. Silex barely made it out alive, suffering terrible wounds to one wing, to the point where he struggles to fly. Despite his injures, he managed to make it to the Kaamil tribe, half frozen, but alive. The Kainura, impressed by his skills, offered him an invitation to the tribe, to keep him safe from his murderous family. He learned powerful magics from the Kaamil spell casters, so that he could have a chance of defending himself if he ever gets into a fight. Silex learned many secrets from the leader of the Kaamil tribe. Esridar even let him read restricted articles that held forbidden knowledge in exchange for Silex's help in solving some of the mystery's the Mirror Tomb held, and for assisting the Sai with any difficult cases. So far, Silex has even advised Esridar on certain situations. Some dragons believe that Silex isn't a natural dragon, and perhaps an experiment due to his odd nature. But, it was just a rumor a Kaamillian brewed up to make others distrust him even more. Or so it seems. Scale/Fur/Feathers:Light obsidian sharp scales with stripes of red violet. (Turn black in darkness) With black scales on the forelegs and facial markings. Eyes:Bright Lavender that turn red in the dark. Horns/Spikes: Two long black top horns and two horns that curve down at the same length. His spine is covered in tiny black spines, and his tail is covered in black spikes. Silex can pick up any subtle details, hidden meanings, or secret messages in speech, body language, and even noise or images. He can figure out problems exceptionally quick, and tell if someone is lying or concealing information. He is able to understand and predict a dragons behaviour, even if he cannot empathize. Silex can remember locations almost perfectly, being able to identify key information about locations and specific encounters. Silex can accurately tell the time and date at any point, and can quickly recall any information he has heard, seen or read within the past month. 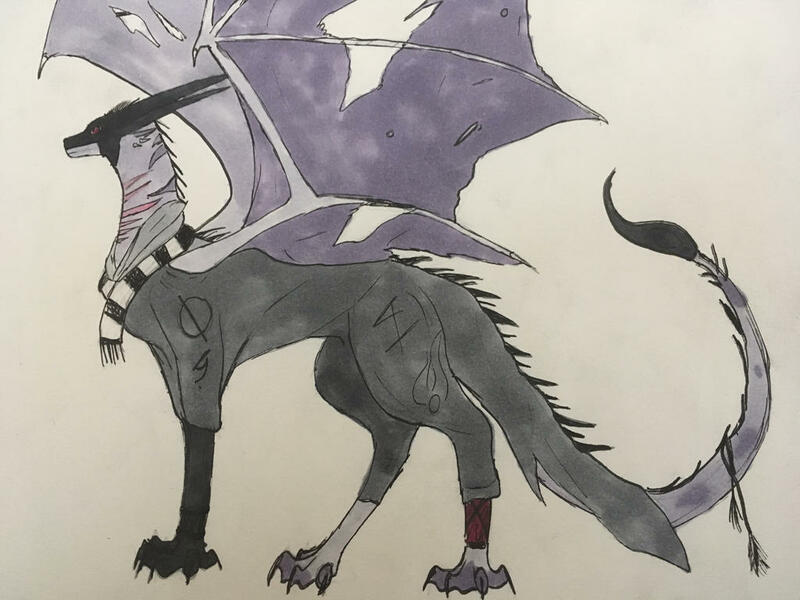 He obtains skill with observation, forensic sciences, and logical reasoning that most dragons believe is fantasy, even his ability to draw large conclusions from the smallest of observations unsettles dragons, some even believing him to be psychotic. Silex always knows where he is, and the most direct way to get somewhere if he knows of the place. Silex can quickly pick up any new information that he deems useful, being able to pick up information about an opponent, situation, or problem within seconds. Silex has a resilience to mental attacks, influence, or magics. It is very difficult to psych him out. Silex isn’t easily persuaded, or influence him towards different objectives. Being naturally nocturnal, Silex has good night eyesight, and has adapted to seeing well in blizzards. A physical talent that he picked up after joining the kaamil, Silex has the ability to precisely and skillfully move atop deep snow without falling in. Mostly because of his light weight. He can also use this skill to escape or defend himself. Silex grew very courageous in his youth, and isn’t deterred by pain or danger. Strength: After feeding, he as strong as three dragons twice his size combined. Silex has little to no patience, which can cause him to act impractically or rush into things. Due to an ancient wrong done by his rare species, Silex has to survive of the life force of others. However, he refuses to feed on others and tries to survive on animal blood. This causes him to become increasingly weaker over the days. The Kainura is currently trying to convince researchers to find a solution. They have managed to reduce the fatal effects, but Silex is still exceptionally weak most of the time, and may faint occasionally. This can be problematic in certain situations. He can loose control of his senses if he goes without feeding on animals for a long time, causing him to lash out at a nearby dragon and try to feed from them. This has happened once before. Silex’s wings are very damaged, making it near impossible for him to sustain prolonged flight. Silex hates "wearisome" uniformity or routine. When he gets bored in such routine, and isn't intellectually stimulated he can get depressed or even stranger. Often taking chances he wouldn't normally, to the point of chasing down dangerous encounters, and risking his own life. Sometimes he'll just try to find some way to be intellectually challenged or stimulated. Weapons or anything Silver burns him like acid. Silex can control swarms of insects (or create) and have them attack creatures. He mostly uses this as defense so he can escape fighting. The range for this spell is 120ft. Silex can set an alarm against unwanted intrusion. It must be set at a door, a window, or an area within range that is no larger than a 20-foot cube. Until the spell ends, an invisible alarm alerts him of whenever a small or larger creature touches or enters the warded area. When he casts the spell, Silex can designate creatures that won't set off the alarm. He can also choose whether the alarm is mental or audible. A mental alarm alerts with a ping in his mind if he is within 1 mile of the warded area. This ping awakens Silex if he is sleeping. An audible alarm produces the sound of a hand bell for 20 seconds within 60 feet. This spell when casted, will randomly every 10 seconds will teleport Silex from the current plane for a few seconds (5-10) he vanishes from view. After 5-10 seconds he will return to an unoccupied space that is 10 feet of the space Silex vanished from. If no unoccupied space is available within that range, he appears in the nearest unoccupied space (chosen at random if more than one space is equally near) Sometimes (50-50 chance) the spell will not teleport Silex from his position. He can cast this spell only three times a day. When this spell is casted, Silex will move at two times his normal speed for 12 seconds. (150 mph max) He can cast this spell an unlimited amount of times within twenty minutes of each casting, unless he has casted Blink within the past hour. Silex’s fire is pitch black. It is extremely hot and extremely cold at the same time, which can cause pretty nasty damage. Silex transform up to ten centipedes, three spiders, five wasps, or one scorpion within range into giant versions of their natural forms for the duration (60 seconds). He can only cast this once a day. The range for this spell is 120ft. Silex can sense magic spells, magical influence, and any magic based objects or articles in a 100ft area. Blink: "He can cast this spell only a few times. (3)" I don't quite follow with this? Is it three times per day? Zephyr Speed will most likely need to be toned down in the future. Buuut I don't know about that yet.